It’s been a while since I have spruced up our back deck and patio area. Truthfully, the unbearable heat this summer kept us from going outdoor and enjoying our entertaining area. With the fall season fast approaching I am getting excited to do some entertaining, get a fire going and enjoy some pizza in our outdoor pizza oven. We enjoy the fall season to the fullest here in the South. The season lasts long here. Starts around mid September and all the way through November we enjoy the perfect temperatures. All these beautiful trees you see in our backyard and an abundant array of color. You can only imagine when FALL, really comes into play. 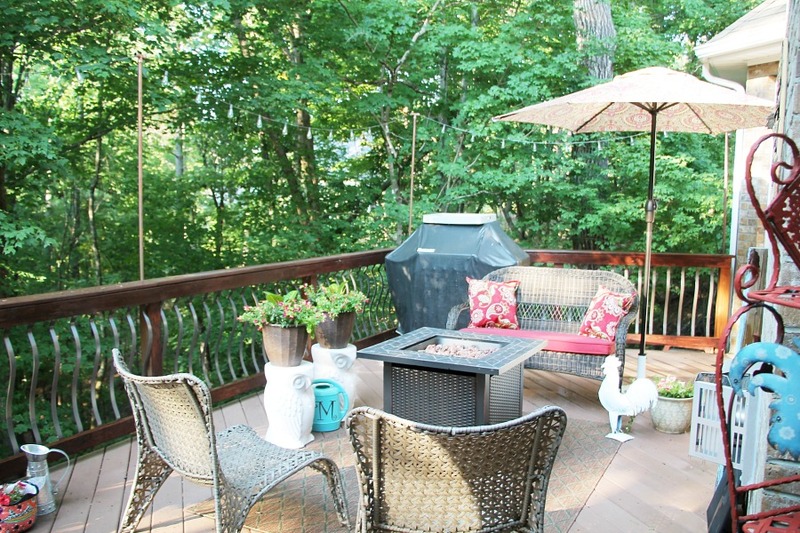 Most all those leaves you see around our upper patio fall right onto this deck. I have learned by now instead of being neurotic and going out there every day with the blower, either Mike or myself will go out once week. I may get lost in the piles, but it’s not too bad a job with the blower and right back down into the woods the leaves will go. I am thankful for our Trex decking. If we had a regular wood deck it would be stained, weathered and worn in no time. The maintenance would be a bear to keep up. We essentially do nothing to this deck year after year. We have been in our home for almost 12 years now and the deck still looks as good as new. On occasion where I sit my plants and move them around I may have to use a spray cleaner recommended for Trex decking. Clean up is a breeze with a few sprays and rinse. It’s a little too early to be adding some pumpkins and scarecrows out here. For now I potted some seasonal flower, bought a couple new outdoor pillows and this year added an umbrella out there. I have a vision of reading a book on a cool fall day under the umbrella with the fire pit going. That’s the vision in my head, whether or not it will be is yet to be determined in the near future. Thanks so much for stopping by today. I am totally inspired once again for a new season, and a new reason to simply spruce up. 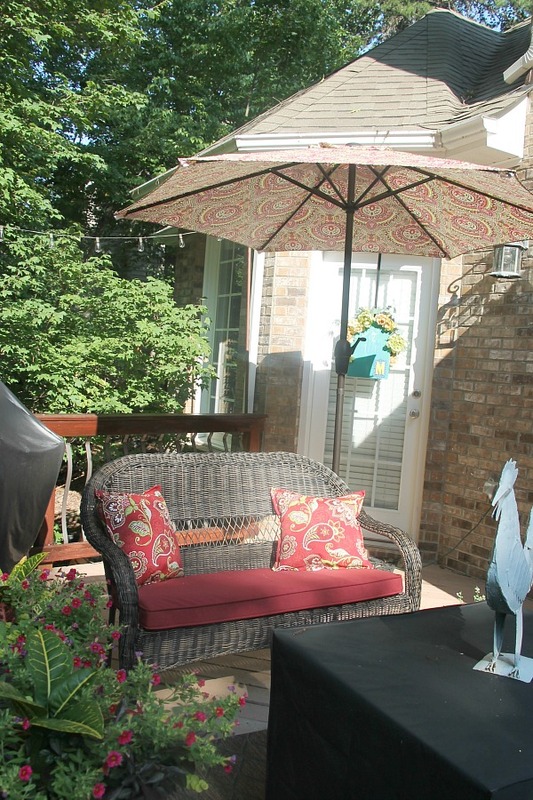 Everything featured on our back deck is from Lowe’s Home Improvement. 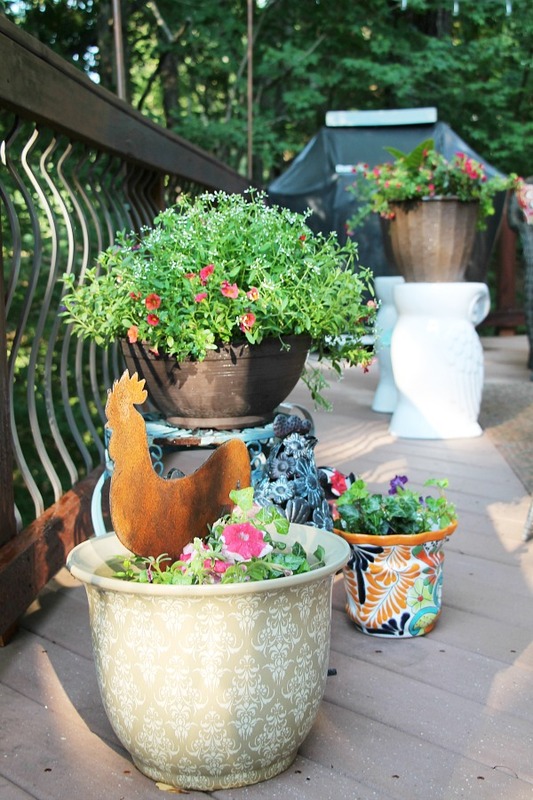 Except for the decorative ceramic owls, and a few rooster accessories. Lowe’s graciously offered me a gift card for the season to make a few small fluffs. Because we LOVE our Trex decking so much I want to leave you a link to go check it out for yourself. This may be on your plan for future deck and rails. Trex (is the leader in high-performance, low-maintenance outdoor living products). You can check out their website https://lowes.trex.com/. Add to your next must have to do list! In the meantime, I’ll meet you at the front door and we can come hang out on the back deck with some warm apple cider, or beverage of your choice. 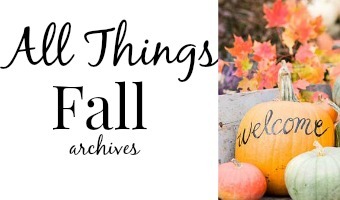 For more Fall decorating ideas you can check out my gallery. I just love your deck! 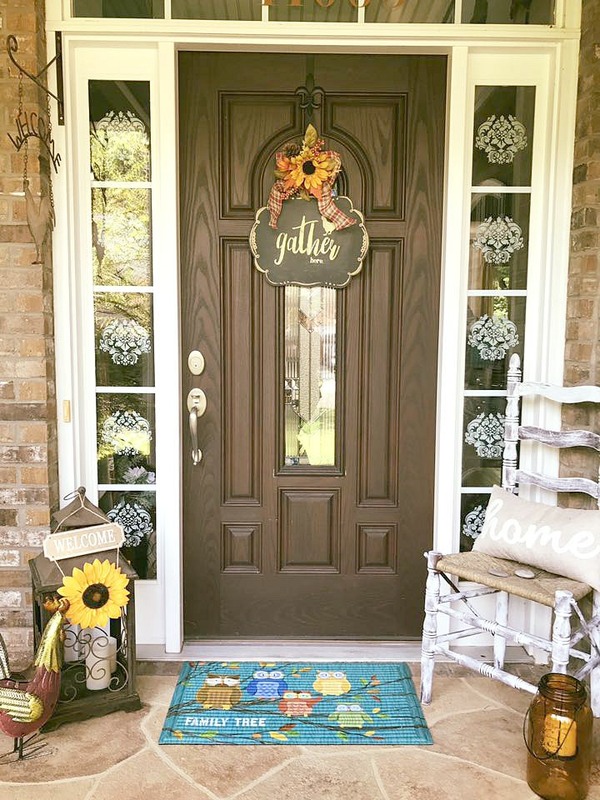 Your front entrance is all ready for fall. I’m with you, can’t wait for FL temps to drop so I can enjoy my backyard patio. So happy to see you posting again on your blog! Thanks Kathleen. I enjoy the season and am inspired to do more fluffing around here.! Love your site, very inspired!!! You’re deck looks great and I love low maintenance anything! We’re going to install Trex decking on the porches at our Mountain Cottage. It’s all so beautiful! And I’m so ready for fall! Thanks for the inspiration! I love your front porch! And your deck! And your trees!!! Thanks for the inspiration Deb! Oh, Debbie, I thought you were never coming back. I know lots of people have missed you. I love your deck, Debbie. It looks so comfortable and inviting. Your deck area is so inviting. What a great space. Love the front porch too. Nice deck. 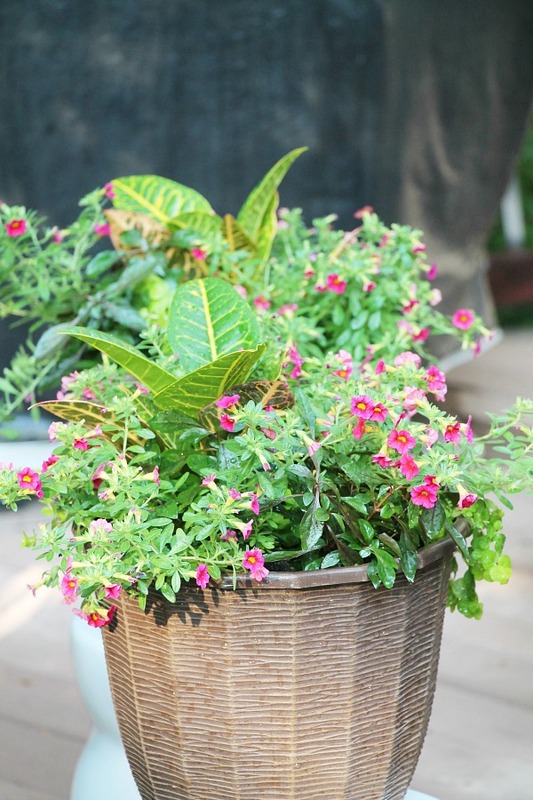 I’m having a blast looking through your fall ideas.So many fun ideas. lol…I am never ready for fall because then comes the harsh Michigan Winters!! We do have beautiful fall colors here though….I am a summer girl…. I love this! Wonderful ideas for the front and the back!!! Fall is almost here! I am in Georgia also and a little cooler this week in my neck of the wooods! Hello Debbie, your deck is so inviting; yes I’d love to sit and read a book on a nice Fall day. You MUST do it!!! Love the Fall just wish it would last till November here (ususally it’s wintery here in northern IL by then). 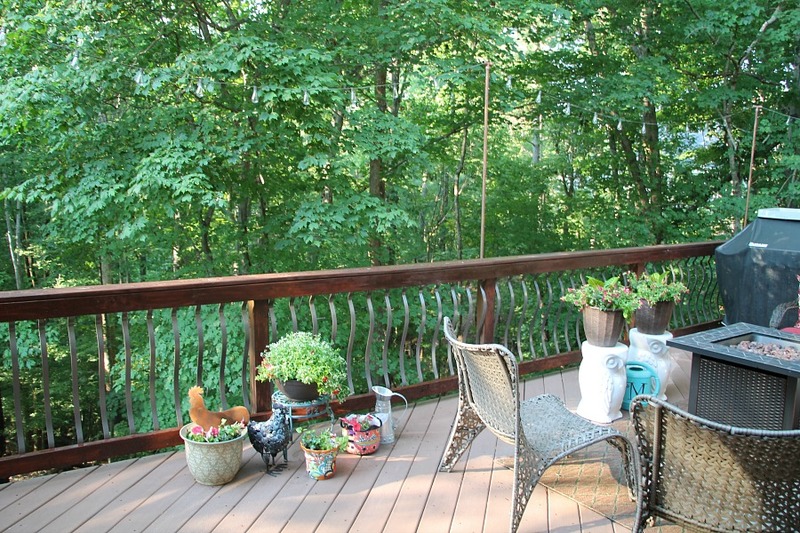 Thanks for the post and enjoy your beautiful deck!! Hi Debbie!!! 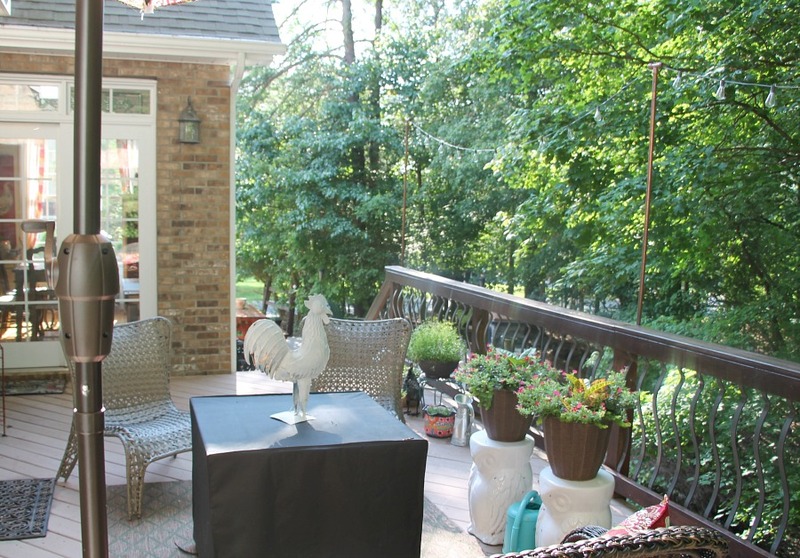 I love your deck…it is a beautiful place to entertain and oh that pizza oven!!! Can’t imagine how great it must smell when the pizzas are in the oven. I love your blog and all you do to keep us up to date… your deck is awesome. Question ? when do you think is a good time to start putting up our fall decorations outside? September 1, no matter the temp, is time to decorate! My favorite is fall in Alabama!!! I love your site wonderful ideas.EVERYTHING LOOKS SO WARM AND INVITING AND THATS MY FAVORITE LOOK!